For those who haven't seen our original paper on the explosive-demolition theory, it's posted at www.911-strike.com/pentagon.htm. For the time being, I would simply like to address Dr. Wyndham's comments about the 2005 article "Eyewitnesses and the Plane-Bomb Theories" as it appeared at www.911-strike.com. It appears that Dr. Wyndham has missed the Excel spreadsheet where the results were initially tabulated. The spreadsheet was linked from the sidebar of the article, and is available at www.911-strike.com/PentagonWitnesses.xls. In the spreadsheet, I created two categories of insiders. The first category was "DEEP INSIDER = High ranking military brass, contractors, politicians, editors of the corporate media; or members of the Pentagon renovation team". The second category was "INSIDER = Federal government or military employee, corporate media reporter". In the text of my article, I wrote: "Out of the 31 explicit witnesses, 13 had what I would consider "deep" insider connections, while 24 of 31 worked for either the Federal Government or the mainstream media." The totals of 13 and 24 individuals respectively, were taken directly from the spreadsheet. My text also mentioned "a category of 'elite insiders' who were either highly placed military officers, government officials, media officials, or employees of the Pentagon renovation team and security staff". As it was defined, this category represented a union of the two types of insiders in the spreadsheet. However, the text of the article did not report the total number of individuals in this category. The term 'elite insider' was an unfortunate shorthand expression to represent the concept which was, however, clearly defined. If I were to rewrite the article today, I would use the term "insider" to represent this category, and "insider employee" to represent the category that I originally called "insider". The results of my analysis were also presented in the form of a series of HTML markup tables which were linked from within the body of my text. In those markups, the results of the spreadsheet analysis were not always completely presented. Wyndham appears to have attempted to re-constitute the contents of the original spreadsheet, from the remarks in the HTML markup tables. This misunderstanding led to Wyndham's comment that "In his analysis, Russell explicitly identifies only 6 'elite insiders' so that we are left to conjecture as to the identity of the remaining 7 of the 13." However, no need for conjecture is required, if the original spreadsheet is consulted. Wyndam's Appendix D, table 1, and the associated text, needs to be updated based on the actual contents of my spreadsheet. The entire study was based on "eyewitness" lists which had appeared earlier in the literature, and many of those were not actually eyewitnesses. Therefore, the various categories included some witnesses who based their testimony on hearsay rather than direct experience. Thus, my tabulation of "explicit witnesses" included three who were highly explicit but not eyewitnesses, as Wyndham points out. Also, some witnesses were excluded from my "explicit" category based solely on my judgment that their vantage point was too far away from the scene, to allow them to judge between an overflight vs. impact. As Wyndham states, this criterion might have excluded some good eyewitnesses, but this was not done on the basis of arbitrary bias. "And even if there is ever a trial or investigation, if the eyewitness statements to the jury are similar to the statements quoted in the press, the weight of this eyewitness testimony in favor of a 757 impact will be extremely difficult to overcome -- unless some conclusive physical evidence emerges against the 757 theory." Regarding Comment 1, my thanks to Dr. Russell for pointing out that, of his 31 “explicit” witnesses to impact, the 13 “elite insiders” and the 24 who “worked for either the federal Government or the mainstream media” are identified in his Excel spreadsheet found at www.911-strike.com/PentagonWitnesses.xls. My attempt to identify these from the HTML markup tables was mostly correct (I identified 10 of his "elite insiders"), but it missed Russell's inclusion of Bauer, Hemphill, and McGraw. Instead, based on my understanding of Russell’s definition of “elite insider,” I included Anderson, Elliot, Narayanan, and Owens, resulting in more (14) than the 13 identified by Russell. These corrections will appear in any future revision of my paper (see Appendix D). My own analysis identified only 9 individuals who I would consider to be "elite insiders." In addition, I acknowledge the full quote, with its two conditions, concerning the difficulty of overcoming the eyewitness testimony in a court of law or investigation. Since these conditions would not come into play unless the current evidence changed appreciably, they were omitted in my paper for the sake of brevity. As shown in my paper, the “elite” insider hypothesis has many difficulties and is, in my view, very unlikely to be valid. More likely “It is possible that the high incidence of insiders among the highly explicit witnesses, is simply a result of the location of the incident” as Russell himself conjectures. “I find your treatment of the Pentagon witness statements puzzling. For example: "I was about 100 yards away" he said. "You could see through the windows of the aircraft…" I have 20-15 corrected vision, and I am pretty sure that under most or all light conditions, I could not see through the windows of a large STATIONARY aircraft at 100 yards, based on my experience in airport lounges with picture windows. But a plane going at the improbable sea-level speed of over 500 mph?! It has not been shown that any of the eyewitnesses to impact are lying, nor have the difficulties with such a hypothesis, as detailed in my paper, been addressed or overcome. The combined evidence, eyewitness and physical, points strongly to plane impact as the most plausible explanation for the damage and debris at the Pentagon on 9/11. However, the additional use of explosives or bombs is not ruled out by the evidence at present. The section Correction to the Second Floor Gash Length that appeared in version 1 was removed. The so-called gash in the second floor was based on a faulty interpretation of a photograph that apparently showed such a gash. A further study, using a video that captured the interior of the Pentagon after debris had been removed, showed that this “gash” was in fact the area where the second floor collapsed. There is no evidence of a “gash” produced by the top half of the plane impacting the second floor slab. There may possibly have been such a gash before the second floor collapsed and removed any evidence for such a gash. The author is indebted to Ken Jenkins and Frank Legge for discussions that resolved this issue. Version 2 also corrects Jerry Russell’s “31 Explicit” Eyewitnesses to Impact (Table 1) and the accompanying text in Appendix D.
In the paper The Pentagon Attack: Eyewitnesses, Debris Flow and Other Issues - A Reply to Fletcher and Eastman Version 2, the description, on page 37 (Appendix C), of the light pole that struck Lloyde England’s taxi cab, is incorrect. Recent detailed research by Wayne Coste has shown that the large mast of light pole #1 was not, as stated in the text, the pole piece that entered the taxi cab windshield. Through his analysis of a series of photographs of the pole pieces for light poles #1 and #2, Coste proves that it was the much smaller lower lamp support arm of light pole #2 that entered the windshield. The plane hit light pole #2 just as England’s cab reached that location, and the pole broke into several parts, with the lower lamp support arm piercing the taxi’s windshield. The length of this piece of pole matches the dimensions in England’s rough drawing of the cab and pole, and comports with the hole in the back seat of the cab. By the time England had stopped the cab, he was at the location where the mast of light pole #1 was lying on the roadside. 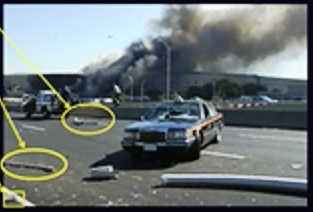 This figure from a portion of Coste’s video presentation shows the taxi cab, the mast of light pole #1 (lower right), and the lower lamp support arm of light pole #2 (left in lower ellipse) after a passing motorist helped England remove it from the taxi’s windshield. In the background in the other ellipse is another portion of the mast of light pole #1. For more details, see chapter 9 starting at 02:50:21 (slide 504), of Wayne Coste’s video presentation . Explanation of the Evidence at the Pentagon on 9/11, "Explanation of the Evidence at the Pentagon on 9/11" by Wayne Coste, 2018.